The Northbridge Historical Society was organized and incorporated in 1971 as a non-profit organization dedicated to perpetuating Town of Northbridge history and preserving and protecting documents, buildings and items of historical significance. The Society is the owner and custodian of the historic Fletcher House where articles, documents, and other historical memorabilia in the Society’s possession are kept. Additional donations to our collection are gratefully accepted. The Society holds a number of meetings of historical interest yearly in its efforts to enhance awareness and promote preservation. The Society welcomes the support and participation of all. 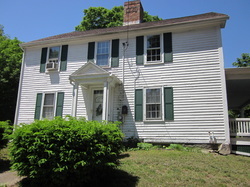 One of only two remaining 18th century structures in Whitinsville's National Register District, this house was built in 1770 by Colonel James Fletcher. Fletcher set up the first iron forge in the community and later established a cotton mill. He served in the Revolutionary War and held many town offices. Colonel Paul Whitin began his career as an apprentice in Colonel James Fletcher's forge, and in 1793 married Fletcher's daughter Elizabeth (Betsey) Fletcher.